Let’s face it, to the average business person, marketing equals promotion. Marketing is what you say and how you say it when you want to explain how awesome your product is and why people should buy it. Marketing is an ad. Marketing is a brochure. Marketing is a press release. And more recently, Marketing is a Facebook page or a Twitter account. Marketing, to many business people, is simply selling at a larger scale. The reality, is that marketing sits at the intersection of the business and the customer – the great arbiter of the self interests of the business and the needs of the buyer. At a fundamental level, marketing is the process of understanding your customers, and building and maintaining relationships with them. Marketing is the key to an organization’s success, regardless of its size. There are several types and sub-types of marketing, digital and offline. You should determine and pursue the ones that work best for you. Marketing and Sales teams need to have a unified approach. Automation helps them work towards the same goals. There I was, minding my own business, resting after completion of an amazing content marketing strategy workshop for a client. And someone asked about my opinion on the difference between marketing and branding. This got me a little fired up. OK, a lot fired up! I’ve already tried to define what marketing is many times here. I’ve tried to address the common perception of marketing as being all about promoting and selling. And I’ve taken on the problem of advertising, mad men and their “big” ideas, and the sheer idiocy of banner ads. As the global economy settles into a new normal of consistent doubt, Marketing has an identity problem, a brand perception gap, maybe even a crisis of confidence. When I transitioned out of a successful sales career almost 15 years ago, most of my peers thought I was crazy. The head of our division hung up on me (it wasn’t the first time). But I wanted to help shape the future. Naive? Probably. Delusional? Certainly. Possible? Definitely! Marketing is not about who can talk faster, or close better. It is about deep psychological understanding of customer needs. Steve Jobs had this gift better than almost any example. Henry Ford. Thomas Edison. Every innovation in the history of the world combined an uncanny understanding of human needs and the innovative vision to deliver it. If business is composed of marketing and innovation, and marketing is about deep customer insights, then marketing is the job of every employee. Social media has only made this point painfully clear: every employee is an extension of the brand. The brand serves to meet the needs of the customer and the business serves to innovate. I learned in college that marketing is a conversation. Marketing is the conversation that starts between two people who don’t know each other well. Great conversations lead to understanding needs. Great insights like this lead to amazing products delivered through engaging customer experiences. THIS is marketing. When I meet someone I don’t know, I ask them questions. I try to get to know them. I try to understand their dreams and problems and needs. I do NOT talk about myself unless there is a genuine interest from the other person to learn about me as well. But this only comes from true and authentic empathy. I have to actually care about this other person to earn their trust. This conversation continues as we get to now each other better. And like human relationships, the brands who continue into deeper connections are the ones who seem to care more about the other person than they do about themselves. The brands who win more customers are the ones who put their customers ahead of their desire to sell more stuff. They show potential customers that they are interested in solving real problems. They don’t just act like they care. They actually care and they prove it in the way they act. They genuinely seek to help their customer to improve their lives through their content, their expertise, their passion and, if they are lucky, through the stuff they sell. And like in real life and common human interaction, Marketing means you have to give much more than you hope to receive. Great marketers are passionate teachers, giving away their expertise with only the hope that they are helping people. The business benefit is in establishing trust, and building an audience of people who believe in you to help them in times of need. When given a choice, we only buy from brands we know, like and trust! But how do you do you explain the power and importance of empathy to executives who don’t have any? How do you explain empathy when businesses only want to sell, and promote, and hang their logos on stadiums and golfers hats? You have to show them that, as a society, we tune out ads, and promotion, and ego-driven marketing tactics. Promotion and propaganda don’t work in today’s world. But we tune into content and brands that helps us. The only way to accomplish this is for brands to create content that actually helps people. And lots of it. Because we have been burned many times. We are skeptical. We are tired. And angry with auto-play video ads on the sites we like to visit. I’m sorry if that’s hard to hear. Hey, I’m one of you! I want to be a part of great, meaningful work that contributes to the success of a business. But as even Christine admitted, it’s really hard to deny the point that much of marketing is broken. Look around you. Can you remember the last banner ad you saw? I think that too much of marketing is tactical. The boss asks you to do something. The marketer goes and does it.And usually that thing is something promotional and ineffective. Partly because we don’t care if it’s effective. We only care if it gets done. I believe we have to remind the boss what the brand stands for. Every business is started in order to solve a customer problem. The company grows and becomes successful because it created something unique and helpful. But as the business grows, too often the focus becomes the business, not the customer. But your brand is more than what you sell! But to be truly effective, shouldn’t marketing start with a focus on meeting customer needs? Marketing should be telling stories, not selling products. That’s why I define content marketing as the simple process of answering customer questions. The business that wins becomes known and trusted as the brand that solves customer pain points along their buyer journey. I believe that too many of us lose sight of that commitment, and that is why I think that in many businesses, marketing is broken. There’s a huge a cultural element to this. I believe the executives inside the business need to be held accountable for creating a culture of customer-focused content. But it’s also up to us in marketing to push back. I know it takes courage. I know it’s hard. But that’s the difference between the marketing that’s broken and the marketing that works. In the video I talk about NewsCred customer ConAgra and how they went back to the roots of their business to create a content hub called forkful.com where they publish content they think their audience is interested in. And in doing so, they are reaching people that their ads would never reach. I learned a long time ago that your brand is something that exists in the mind of your customer. Ads don’t change the perception of your brand. Branding is a judgment, a sentiment, a feeling, that is created by the sum of all the interactions I have with a company. Only experiences change the perception of a brand in the mind of the customer. Brands must deliver amazing customer experiences. Not just in the products we sell, and how we well we deliver “features,” but in the way that we behave as companies, in the way your employees treat me, in the sum total of all those experiences, a brand is created. I believe that Apple and Starbucks care about delivering great technology and good coffee. But I also believe that Apple delivers on the promise of easy to use products, simply and beautifully designed. I believe that Starbucks cares more about their impact on the world than selling more coffee. True or not, this is the experience I have with these brands. This experience sits deeply inside my mind. And no advertisement, logo, or sales person could change that. Marketing can impact the brand in a positive or negative way. Marketing can help create a positive brand experience by having positive, helpful, and empathetic conversations with their customers. Marketers can hurt brands when they interrupt our TV shows and web experiences by showing ads of men with pretty girls on one arm and their product in the other. Companies that think that a million dollars in sexist, promotional advertising, logos splashed everywhere, grumpy employees, and aggressive sales people are simply lost. They don’t understand the world we live in. Marketing helps build brands through great experiences. In the perfect world, marketing supports building strong brands. Great brands do great marketing. They act as teachers to their audiences. They deliver amazing products. They treat their employees with respect. They act like concerned global citizens, thinking of the generations to come. And they consider the planet that their children will inherit. Great brands show us who they are in the experiences they deliver. Marketing seeks to understand what a great experience should be. Advertising interrupts our experiences and sometimes we don’t hate them for it. Advertising is great, for brands who can afford to interrupt the content we want to consume. I appreciate some ads that tell a great story or are very clever and open about interrupting my content with something emotional or funny. But I honestly don’t even remember the brands behind many of the ads that made me laugh the most. I appreciate Dove for “Real Beauty.” I give them credit for what they were trying to do. I am sad that they stopped. I appreciate Always for “Run Like A Girl,” but the impact would have been greater if they ignited a movement and created a real content brand from all that momentum. THAT could make a real impact on the world and would help change the brand perception of the brand. Interestingly, the brands I mentioned earlier, Starbucks and Apple, do very little advertising. The best ad ever was Apple’s 1984, which told a story of disruption in a compelling way. But it was backed up and followed by products that truly changed my life. But if we’re being honest, we don’t want to be advertised to, any more than we want to be sold to. And this is true especially for stuff we don’t need. When a site plays an auto-play video ad, I hate them for it. But I hate the brand even more. Because I know they are the one paying for it. Publishers have to make a living. So I give them some slack. But the brand gets the brunt of my frustration. So we have moved beyond a time of tolerating ads to actually having interrupted ad-driven experiences cause us to think negatively about them. For those who think that marketing is the same thing as advertising, nothing could be further from the truth. Advertising can certainly be one small part of a marketing plan but it’s only one piece of the puzzle. Indeed, it’s possible to work from a marketing strategy that doesn’t utilize advertising at all. Marketing can roughly be split into offline and online or digital methods. Offline marketing consists of “traditional” advertising in print, radio, and television marketing, as well as attending events like tradeshows, fairs and conferences. It can also include word-of-mouth marketing. Most businesses will use a combination of online and offline marketing methods. However, these days the balance is shifting more towards online marketing. This is because consumers are increasingly spending more time online and digital marketing offers various advantages in terms of speed, efficiency, and ROI. Content marketing – Publishing content in different forms to build brand awareness and nurture relationships with customers. Content marketing is usually thought of as a type of digital marketing but it can also take place offline. Examples of content marketing include blogs, posts on social media, infographics, and video. Search engine optimization – Commonly known as SEO, this is the process of optimizing the content on your website to make it more visible to search engines and attract more traffic from searches. Social media marketing – Using social networks like Facebook, Instagram, and Twitter to build relationships with existing customers and reach a wider audience through digital word-of-mouth. Email marketing – Sending regular email communications to users who have signed up to your list to build relationships and drive sales. Retargeting – Contacting existing or potential customers after they have already had an interaction with your brand to get them to come back or convert into a sale. For example, placing an advert on their Facebook feed of a particular product they’ve looked at on your site. Influencer marketing – Using individuals with a high profile and many followers on social network channels to promote your product or service. These are just a few examples of the most popular types of digital marketing in play today. 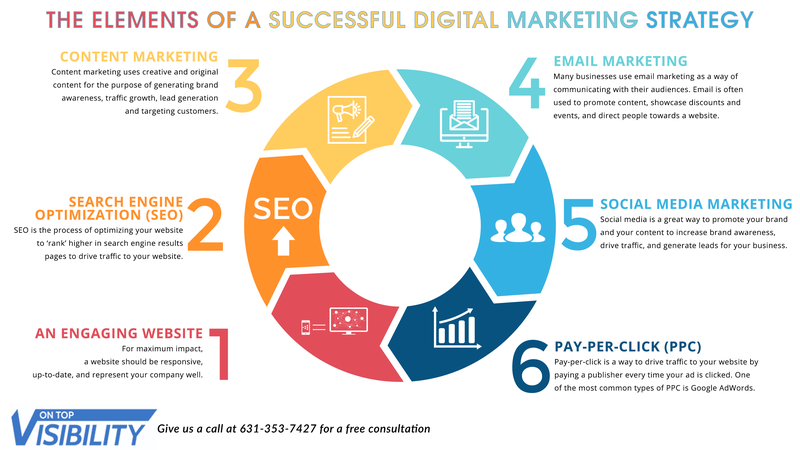 Each of these methods can be broken down into several other types of marketing and there are indeed hundreds or thousands of different types of marketing covering both online and offline channels. No business relies on just one form of marketing. On the other hand, unless you’re a multinational corporation with a practically unlimited budget and resources, it’s not possible to tackle all different forms of marketing either. To form an effective marketing strategy for your individual business, you must select the types of marketing that will be most effective for you, and form a plan in which they are integrated into a master strategy. Sales and marketing are closely linked but they cover very distinct activities in your business. The sales team doesn’t have any say in what the product is or who buys it – they simply take leads and convince them to buy. Employees working in sales must build close relationships with your customers and they need intelligence from marketing in order to do this. The marketing team provides these leads by informing potential customers about your brand and product. They also use customer feedback and intelligence to decide what products to produce in the future or how to change existing products so they meet the customer needs better. You won’t be effective at selling unless the people you are selling to already have some awareness about your brand or product – this is what marketing can do for you. For a successful strategy, marketing and sales teams need to work closely together and have a unified approach. This ensures that only good-quality leads are passed to the sales team. You can use a marketing automation platform to align your marketing and sales teams to ensure they’re working more efficiently towards a common goal. In marketing, knowing your customer is key. In fact, some marketers go so far as saying that marketing is essentially the process of understanding your customers. Marketing should start right at the beginning of your business journey, before your brand even takes form. This initial marketing involves research and learning more about your customers in order to develop a product or service that meets their wants and needs. This in-depth customer research isn’t a one-off marketing task, but one that is continuous. Focus groups, customer surveys, and collecting user data online are all ways that can help you to learn more about your evolving customer base and ensure that your brand is communicating with them in the right ways. After a particular product or service has been introduced to the market, its success must be evaluated to see if it’s meeting customer needs. Marketing also plays a part in customer service and nurturing customer relationships. It’s not just about attaining new customers, but also making sure you get the most out of your existing customers and that they stick around for as long as possible. Digital marketing has opened up a new world of possibilities when it comes to understanding your customers better and building relationships with them. We now have the ability to collect a vast amount of data about individuals including their demographics, location, shopping habits, previous brand interactions, likes and dislikes, and more. This data can be used to build a picture of your customers in a way that’s much more accurate and meaningful than the traditional “customer avatar” exercise. Product – what will your product or service actually be and how does it meet the needs of your customer? Pricing – what price will you set your product at? This is not always a monetary figure as customers may exchange their time or information for a “free” product. Place – how do you deliver the product to the customer? Do they come into a physical store or do you sell online? Are you targeting a particular geographic region? Promotion – what marketing methods will you use to tell the world about your product? Getting the marketing mix right means you’ll be able to align with your customers’ wants and needs, strengthen your brand presence, and maximize your ROI. The concept of the 4Ps marketing mix was thought up well before the internet became a part of normal everyday life, but it can be adapted pretty easily to form the basis for developing a marketing strategy in today’s digital world. In the digital marketing mix, the 4 Ps are the same, but the approach is different. Product – The internet means that you can have a business with no physical inventory. Instead, you can sell digital products such as e-books and courses. Even if you do sell tangible products, the process of product development has been forever changed. It’s now possible to order and create products on-demand to test out the market first, and the ability to survey your customers quickly and easily means you’re less likely to make mistakes when it comes to product development. Price – Digital marketing technology means that you don’t have to decide on a single price for your product or service – you can dynamically adjust the price depending on who’s viewing it. There’s also more flexibility when it comes to pricing models, with subscriptions and recurring payments made more accessible to businesses and customers of all kinds. Place – Clearly the main difference here is you’re selling online instead of in a bricks-and-mortar store. But there are also many different channels to explore when it comes to selling online. Your own website, online market places, email, and social media are all avenues to consider. Promotion – Again, you’ll still promote your product but the methods are different than what you would have used 30 years ago. Instead of direct mail and print advertising, your strategy might include email marketing and social media marketing instead. It’s common for small businesses in particular to underplay the importance of marketing. However, it’s arguably the case that every business needs marketing to succeed. After all, how will you sell your products and services if nobody knows about them? This misunderstanding of the importance of marketing most likely stems from the confusion around “marketing” as a term in the first place. 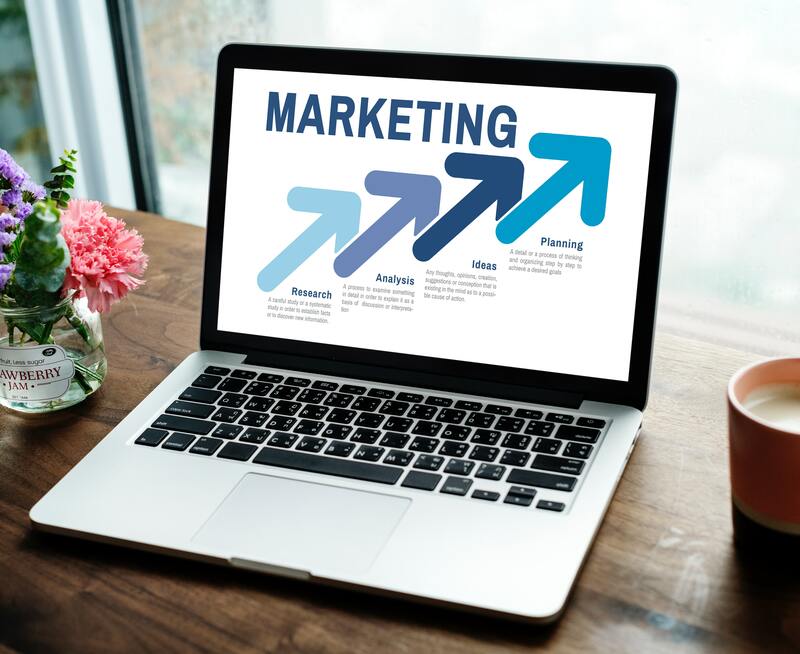 If you’re asking yourself “what is marketing anyway?” or thinking it’s the same thing as advertising, it’s understandable that you may be reluctant to devote budget and resources towards a marketing strategy. It’s true that some businesses have become very successful without using advertising. Krispy Kreme is one example of a global brand that was built on word-of-mouth marketing rather than television advertising and other forms of promotion. They also invest heavily in employee engagement, meaning that each employee is a marketer for the brand and is trained in creating the product and customer service. Camera company GoPro was also launched without advertising. Instead, they relied on the power of social media marketing and understanding their customer motivations to produce a product that customers actively wanted to promote. The GoPro Instagram account is still primarily made up of user-generated content today. As discussed previously, marketing is not just promotion. But rather, it’s about learning and understanding more about your customer. Your marketing strategy will help you to figure out exactly who you’re serving and how you can align your business plans with your customer needs. This will not only result in happier customers but also drive revenue, and ensure you’re heading in the right strategic direction for both short-term and long-term growth. Identify your goals – what do you want your business to achieve in the short and long-term? This may include specific sales figures but also consider factors such as raising brand awareness and your presence on social media. Market research and identifying your customers – learn as much as you can about your target customers. Who are they and what do they want and need? Competitor analysis – what are your competitors doing in terms of marketing? What products are they selling and how are they interacting with their customers? Identify your unique selling proposition (USP) – what are you doing that makes you a better choice than your competitors? How will your marketing reinforce your brand message? Choose your marketing channels – most businesses opt for a blend of online and offline strategies. Again this comes down to understanding your audience – where do they spend their time? What platforms are they likely to trust more? 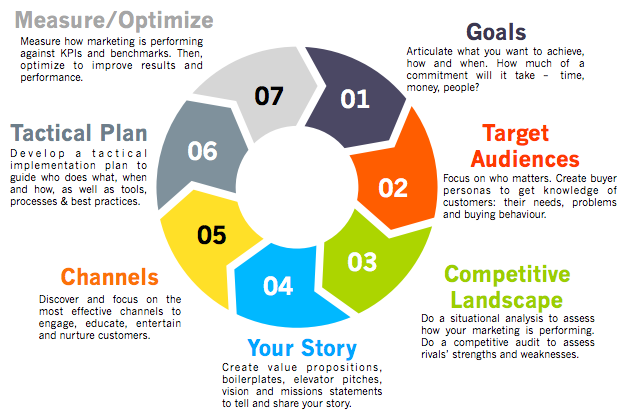 While your marketing strategy lays out the overall aims and direction of your marketing activities in the coming months and years, your marketing plan will provide the details of the actual activities you’ll be carrying out to achieve these goals. Both your marketing strategy and your marketing plan are keys to your long-term success, whether your business is a small startup or a global organization. Wir Sitzen Alle Im Marketing! I’m not sure Google translator gave me the right translation but whether you are in finance, or sales, marketing or the owner of a small business, we are all in marketing. What is Marketing? I did a search on this term to look for some inspiration and found this recent article from Reliving MBA Days that does a great job reviewing the basics of marketing. What is your definition of Marketing? Let me know what you think in the comments below and follow the conversation on Twitter. of mutually profitable relationships between ‘supplier’ and ‘customer’. The problem with this definition (and most others) is that it does not give room to sales. By trying to define what marketing is, we tend to also stress its differences with for example sales, which results in a semantic discussion on definitions and differencens, which does not stimulate/enable the necessary/crucial but very often absent integration of marketing and sales activities. It seems Kundera puts all other functions as being inferior/supportive (my words for lack of better) to marketing & innovation. Do owners/shareholders of businesses see it the same way? Why is that so? I agree with Drucker but can it be that he is overlooking something? Sometimes (potential) customers do not know (or unable to express even a slight hint) what their need is…. Totally agree with Packard. Sadly not a lot of marketeers are willing to / capable of ‘admitting’ this. The ‘we are all in marketing’ seems a bit too much hype for me. I have yet to find non-marketeers who are inspired/motivated by this statement. Thanks Dirk, VERY interesting observations. I don’t disagree with your definition at all. I do think the “marketing and innovation” quote was meant to reference the process of marketing (knowing the customer so well that you have the products they need) and innovation (delivering these solutions better than others could). That is how I read his quote. (Disclosure: I love the Drucker quote) I agree with Drucker and thins he really means that you truly know the customer inherently and deeply and that is how you can anticipate needs that customers may not be able to articulate themselves. I think Steve Jobs stated something to this effect at one point. Thanks for a great post. This is an excellent primer on the value marketing brings. As you mentioned with a backdrop of economic uncertainty, there is a credibility gap found among non marketers. Their view at times,is limited to a small number of marketing produced assets without appreciating the overall contributions of marketing. How can marketers change these misconceptions? Your primer does help. Perhaps this can be fodder for a future blog post. Thanks Irving. Yes, this is just a primer. We should deal with how we close this gap in the future. I have some previous posts on this as well. Hi!, I think Marketing is each and everything that makes you sell MORE. Luis, not sure I agree. Sell more of what? of anything? Marketing needs to also help determine what niche the company can supply uniquely. I won’t pontificate on what marketing is, you have done that nicely here. I want to add a note on the mindset I believe marketers need. For marketing to sit at the intersection of the customer and the business, they can’t keep shouting the company’s message. Instead they need to show a genuine interest in the business’s potential customers and work to make their lives better. Done well, the benefits will come back to them. Nice break from your Tuesday/Thursday schedule! Thanks Eric, I agree completely and like that you brought in the notion of respect. I try to teach my kids the same thing about going in the water at the beach. You don’t need to fear it, you don’t need to avoid, you shouldn’t take it for granted. Just respect the power! I’m off for vacation tomorrow so thought i would mix it up a bit! Have a great rest of the summer. Replace “ad” with “marketing” and you have the definition of “pull”. Thanks Timo, you always know just how to break things down to their simplest level. It’s a real gift! Couldn’t agree more with your post. The Drucker quote is my favorite of the bunch but they are all very good answers. I am not sure how to address the confusion with advertising and promotion but do think it is an issue (and do find it ironic that marketing has awareness problem). Josh, thanks so much for that link. It is perfect. There is a reason Seth has been able to make a living doing what he does: he answers the big questions in really simple and clear ways. I enjoyed the article; great quotes and summary! Translated back into (literal) German “Wir Sitzen Alle Im Marketing!” means “We are all sitting in Marketing!”. If you want to use this phrase in the future, which I think you should, try “Wir alle sind im Marketing!” instead. I figured the translation was off and was hoping some German-speaking friend would help clarify for all of us. Thank you! I think of marketing as two simple things, perhaps not so simple. Know your customer so well that you can make yourself attractive to be found by them and then accelerate their buying process for selecting you. Attracting customers is about connecting with them based on what they care about. Accelerating their buying is about anticipating their buying process needs and feeding them the right information at the right time in the way they need it. The challenge with today’s customer centric marketing is the need to address markets of one. It requires very different thinking and processes. Thanks Jim, I think you are hitting on one of (maybe) the 2 main themese of this whole blog: focus on customers by delivering great content that helps THEM and the second is the transition to a social-digital business mindset that allows the “interest community” (those aligned by common interests, including the brand employee) to serve itself. Perhaps you should expand the definition of marketing to include selecting target markets. A marketer can’t just “know the customer” today. You need to know the customer (or the potential range of customers) of tomorrow, their needs, what alternatives will be available and what competitors will be offering at some point in the future, and what your company can offer at that point. That analysis leads to strategic decisions about who the company will target, what it will offer, how it will reach the target customers (channels), and decisions about pricing, packaging, ongoing support and many other topics. This analysis and these decisions may not be as obvious to people on the outside as branding, advertising and communications, but they are strategic and usually are only be performed by marketers (or general managers wearing marketing hats). I would argue that in many industries (certainly high technology) targeting, and all of the decisions that flow from that, are more important for justifying the marketing group than branding, communications and lead generation. Actually, I see that the linked article on “What is Marketing” at https://relivingmbadays.wordpress.com/2012/08/06/what-is-marketing/ covers most of the points I was making. The key idea is that activities like “opportunity identification” and “new product development” (to use the terms in the article) are frequently overlooked and should always be included in a discussions of what marketing brings to the company. I agree. Once I saw their article, I realized they covered these basics so I focused on some other key points. I propose that the distinction is in the mind of the person being “marketed” or “sold” to. Some look to avoid the sales process, investing time researching and learning on their own, while some jump happily into the sales experience as soon as they decide (on their own or via external influence) they indeed have a need to fill. At best, sales or marketing is the emotional, functional, and aspirational experience that offers solution to my need where, when, and how I want it. At worst, it is an interruption manipulation that upsets and annoys. Wow. I love that line “sales and marketing is a complete sentence” and will promise to attribute the quote because I will likely use it often. Thanks for your insights. Differentiating | How are you different from other solutions, alternatives? What makes you stand out. I disagree with a lot of this Michael. I also have many years direct B2B sales behind me. I view B2C marketing as selling minus the personal relationships because what you sell doesn’t have the margins and profits that enable a direct sales person to sell for you. So you need ‘Stuff’ to do the selling for you. Pepsi can’t afford to send a person to every house and sell. But they can afford to reach via TV. Which is why in marketing emotion is often key because people without emotion will switch brands and products on a whim over simple things like price because that relationship is not there to ensure the value proposition is reinforced. For B2B there are now digital ‘marketing techniques’ that can generate leads but you still pretty much need a direct sales person to close the deal. None of the ‘stuff’ you mentioned will do that in my opinion. Though all that ‘stuff’ can assist. Howie, I believe you may have misread the article. What I am saying is that marketing does not just mean promotion. It needs to focus on the customer. And because that is core to a successful business of any kind, it is the job of every employee. I believe in the importance of sales and count many sales people as my brothers and sisters in arms toward the same objective of meeting customer needs in a way that propels our own business to success. I hope we could at least agree on those 2 points: customers are important, sales and marketing are important. Marketing is the science that study the way to satisfy the needs and wishes of consumers with products, They study the conduct and behaviour of consumers, they life style, they belief, they religion to have a comprehensive understanding of the target of your product and satisfy them with your product. Nice and clear definition. Thanks Jorge. Marketing is the process of identifying and building a mutually beneficial connection between two parties. Ken, thanks so much for that. I agree completely. Great article! I love these discussions. Although I always end up going round and round in my head with it all! 1) What is the ultimate aim of marketing, the marketing dept. marketing people, the marketing function et al? Isn’t it to sell ‘stuff’ in some form or other? 2) As our potential customers get more and more sophisticated and demand falters in the face of ever increasing supply, isn’t marketing simply an increasingly sophisticated way of trying to get our stuff sold? Simple maybe, but clearly not simplistic – it just bothers me that people seem to want to break these things down into various elements in order to feel better about what they are doing? Everyone on the sports team is part of the same team arent they? Even if they play different postions! Hi Tony, it is a circular argument. If you say the aim of marketing is to sell stuff, then marketing will be very “promotional” which in this day and age (and probably always) makes people not want to buy stuff. But when you focus on meeting customer needs, you are in the best position to earn their purchase. Very slight and subtle but important distinction for me. So marketing needs to become an engine of customer need fulfillment. Not of selling (or promoting) stuff. Now I agree with you on the sports analogy. Same team, different skills, same objectives, all equally important! My definition of marketing is: It is a vehicle that delivers the tools to help both the customer and business understand the need or desire for each other’s partnership. Agreeing with Mr Drucker – business is marketing & innovation, I opine marketing is a business function of continuous value creation. It a function which encompasses total value chain & not alone sales. Identifying customer touch points & creating positive and competitive customer experience is marketing. All business functions play the role – sales, design, supply chain, quality, finance etc…Sales is one of the link in marketing chain. Strength of weakest link in the value chain is the marketing strength of any organization. Hence with one weak line, sales, profits & business sustainability cannot be generated. Marketing integrates business front end with business backend. Marketing is the performance of business acts that direct the flow of goods and services from the producer to the customer. It is interesting to look at this question, becasue as a marketing person, you may ask this question many times to yourself.and also want to expain to you boss, this is marketing, not brochure, not PR, not…. 2. Where should we sell? 3. How to sell it? Yes, the target is customer, media is market, and marketing person is the key role. I’ve read nothing here that dissuades me from the conclusion, reached four decades ago, that when most people talk about “marketing” what they’re really talking about is “market communications” — and most of them are, in reality, sellers who think that “marketing” is just a less confronting word than “selling”. Rob Frankel, in his book “The Revenge of Brand X”, offers a simple test: if anyone in an organisation has a title, business card or door or desk plaque saying “Sales & Marketing”, you can be 100% certain that it’s a sales outfit that’s clueless about marketing. My favourite metaphor for differentiating marketing and sales is duck hunting: the marketer knows where the ducks are, what kinds they are, when duck season starts and finishes, what decoys and hooters, etc, work best, knows how to get the ducks in the air at the right time and place, loads the shotgun, takes aim and fires. Then the sales team go and bring back the dead and wounded ducks. When the salespeople have to do more than that, it’s because the marketers haven’t done their job properly. Harsh, I know, but the truth usually is. As for “sales and marketing being a complete sentence”, it reveals the speaker’s profession as a seller. It’s a complete sentence in the same way that “tyres and motor vehicles is a complete sentence” or “cart and horse is a complete sentence”. The syntax may be accurate, but the order is less so. When you put the cart before the horse, you risk going out backward. Thanks John. Not only is that a lot to think about, I really like the way you explain it. You must be in marketing!? of that, thiѕ is wonderful blog. A fantastic read. I love how in depth you went with this article, because marketing and sales is much more complex then even the top paid “guru’s” understand. Why? Because you’re trying to man handle, predict, and create a plan around human interaction and thought. Since we’re complex, obviously, it makes marketing a very complex and deep part of building any successful business or company. I’ve found through most of the companies I’ve worked with, they don’t just lack the more in depth knowledge, they lack the necessary basics. They don’t know how to scale, don’t know what usability is, they produce the same generic invaluable content everyone else does, and those things among others are why they’re held back from reaching their next comma. Thanks for the good read, you covered some of the holes many forget to plug. Thanks Jonathan, I’ve sort of made it my mission to re-define marketing for the world. I appreciate your support!